In conjunction with medical care, proper nutrition is an essential component to managing diabetes. Our Certified Diabetes Educator is qualified to assist in all aspects of diabetes management. Diabetes Self Management Education (DSME) is likely covered by your insurance plan and can help you to achieve excellent control of your Diabetes. We can also provide support for insulin pump wearers with training and support. Managing diabetes during pregnancy is important for both mother and baby. Not only does gestational diabetes pose complications during birth, but can also have lasting effects on you and your baby after birth. In conjunction with your obstetrician, we provide gestational diabetes management to help you maintain a healthy pregnancy. Our team will work with you to provide nutritional and diabetes support throughout your pregnancy and after your child's birth. Eating a heart healthy diet is important in managing high blood pressure. Our dietitians and nutritionists work with clients to provide nutritional support and teach ways to incorporate heart-healthy foods into their diet. Managing high blood pressure by developing healthy eating habits can significantly reduce the risk of having a heart attack, stroke or other illnesses. 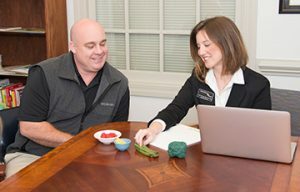 Our dietitians and nutritionists help clients reach a healthy weight by finding a balance between true physical hunger, feeling satisfied, and a healthy amount of exercise. Individualized nutrition care and counseling helps to foster positive dietary and lifestyle changes for long-term weight loss success. Our team works closely with each client to develop the best plan for healthy, sustainable weight loss. An estimated 20 million women and 10 million men in the United States suffer from a clinically significant eating disorder at some time in their life. Nutritional counseling and support is a necessary part of treatment for many who are suffering from an eating disorder. At Nutrition Plus, it is our goal to educate clients and incorporate practical steps to help them find a balance between food, exercise and body image. Our goal is to teach clients how to implement what they learn during their nutrition counseling and implement it in their daily routines. As an add on service, we offer a supermarket tour. During a tour, a nutritionist will accompany a client to the supermarket and point out what foods they should be buying and which foods they should avoid. With so many options on store shelves, this method helps to take some of the uncertainty out of grocery shopping. After a consultation and during follow up, clients are able to work with our team to develop meal plans to suit their needs. A part of the meal planning process involves education, so that clients can begin understanding what types of foods they should be eating, how much to consume, and when to eat. Successful, sustainable nutrition management is dependent on a commitment to healthy lifestyle changes and a client’s understanding of how diet affects the body. While body mass indexing remains the gold standard for insurance judgments of health, we use a variety of body composition elements to better understand our clients’ starting points and monitor health progress throughout their Nutrition Therapy.